Brandy Maslowski, quilt designer, instructor, lecturer, and owner of Brandy Lynn Designs, shared her sweet BERNINA story with me. One Christmas morning in my early 20’s, I received my first sewing machine as a gift from my boyfriend. I remember, it was a tiny little Sears model of some kind, but I knew in that moment that he was marriage material. 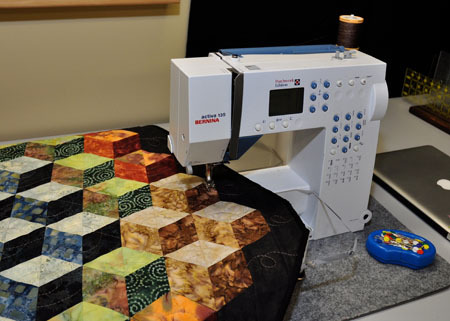 Many years later, married with one child, we researched the market trying every make and model and I fell in love with the BERNINA activa 135 Patchwork Edition. I’m not sure if either of us realized the impact this machine would have on my life, leading to a career in the quilting industry! I always kid around that I make sure my BERNINA sewing machine is seat-belted into the vehicle before checking if anyone else is safe and secure, so you can imagine my dismay the day my machine went silent. I’d never had a problem in over six years and then suddenly, it was like I lost the use of one arm. I went through the usual “I’ve just lost my head for a moment” double checks to make sure it was plugged in, turned on, foot down, foot up, bobbin wound, threaded properly, bobbin winder moved aside…but nothing worked. It looked in mint condition, but no power…nothing. I went to my local BERNINA retailer in Winnipeg, Canada to learn that it was a quick fix of a flat curved electrical wire that had come loose or disconnected and needed to be replaced. The non-quick part about it was that the piece had to be shipped to Canada from the USA. It could take a week. And this just happened to be the Monday before my annual quilting retreat in Gimli, Manitoba. Elizabeth, the owner, assured me that it was no problem – she’d lend me the floor model that was the same machine as mine. I could pick it up on Thursday. I arrived that morning to pick up the loaner to find her husband Terry working away on machines in the back. He didn’t know that I’d be stopping by and had that very machine all apart for servicing! He spoke to Elizabeth on the phone and promptly set me up with a brand new BERNINA 350 Patchwork Edition right out of the box and a huge plexiglass attachment table for the retreat. Needless to say, I was thrilled! Looking back, it was a great sales strategy on his part, and one quilter at the retreat told me, “he’s no dummy!” I was in heaven that entire weekend and completed every quilting project I’d planned. When I returned the sewing machine after the retreat, I wasn’t ready to invest in the newer model, but I had fallen in love with the extended table so I bought that. I pulled out some of the projects I’d completed at the retreat including a charity challenge (black and white with one other color) to show Elizabeth. I told her it would be auctioned off for charity at the upcoming Quilt Reflections Manitoba show. 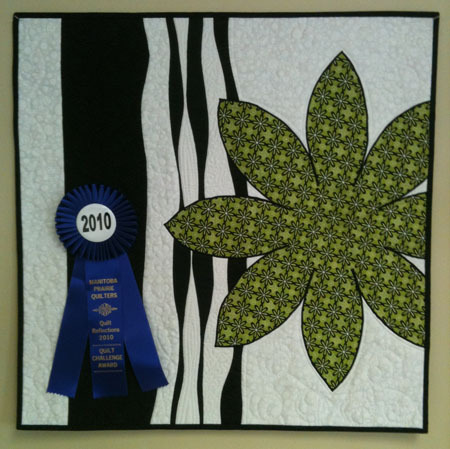 After the quilt show I was thrilled to learn that my charity challenge – That Bloomin’ Curve – had garnered $150 in bids and won a guild rosette for Best Contemporary Piece! I was completely surprised and very honored. Later that day, when I handed over the quilt to the highest bidder, I met a young woman in her 20’s who told me she’d been back and forth all day bidding for her boyfriend’s mom who was out of town at a Quilt Market. It turns out the BERNINA dealership owner, Elizabeth MacKay, had taken a liking to my art quilt. She knew it was made by yours truly with the BERNINA from her store and decided she just had to have it. To this day she has the quilt on display and says that it fits in perfectly with the decor of her newly renovated store. 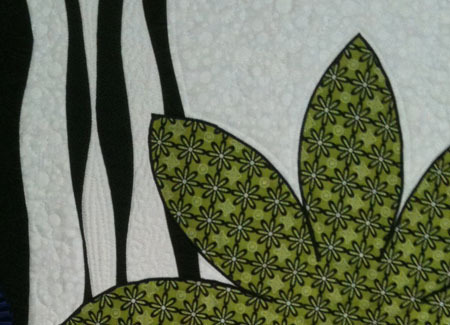 Her BERNINA dealership, Sew Inspiring, and is located in Winnipeg, Manitoba, Canada. To see what Brandy’s been doing with her new B 350 PE, visit her blog at www.brandylynndesigns.com.